Sometimes you reach a point where starting a business is the next logical step in your career. Shweta Cunningham hit that point in hers. When it came time to continue to grow professionally and to use her over 15 years of nursing experience (internationally and within Canada) to their maximum, starting her own business seemed like the best way to accomplish that. The freedom of controlling her own schedule especially appealed because she was raising a young family as well. Rapid Action Nurses provides nursing care and travel injections for people in the comfort of their own home or office. Shweta recently added new services including in-home counselling, postpartum care, and mental health-related harm reduction services. It’s never been easier to get nursing care without missing time from work. Originally from Mauritius, an island in the Indian Ocean, Shweta received her training as a Registered Nurse (RN) as well as a Registered Psychiatric Nurse (RPN) in England before coming to Canada in 2009. Despite the similarities between England and Canada, what surprised her was how Canada could be a “conversational culture,” preferring to socialize and get to know someone before conducting business, compared to England’s “all business first” approach. Shweta discovered Business Link while attending a women entrepreneurs luncheon. This led to using our help when creating a business plan, something she knew nothing about when she started. She was surprised and a little overwhelmed by the scope and size of the process but says that “Business Link was very patient,” as they helped with three separate business plan reviews to fine tune everything. The business plan did its job, and she secured a loan from Futurpreneur shortly after. Shweta also speaks highly about Futurpreneur’s mentor program that comes with every loan. She’s found having a mentor to be a very positive experience. While she has found success, Shweta has found getting people to think about health care differently has been a slower process than initially expected. The original business idea was exclusive to injections but she later added other nursing services to better appeal to market demands. Shweta cautioned that launching a new idea can add another layer of difficulty in a business launch, so make sure that you plan for some additional resources to introduce the concept and allot extra time so that it can catch on. Though challenged with moving from an original idea to something more mainstream, Shweta believes she still has a unique offering. She states that her company offers a “head-to-toe” service incorporating the whole well-being of the person—far more than her competitors offer. 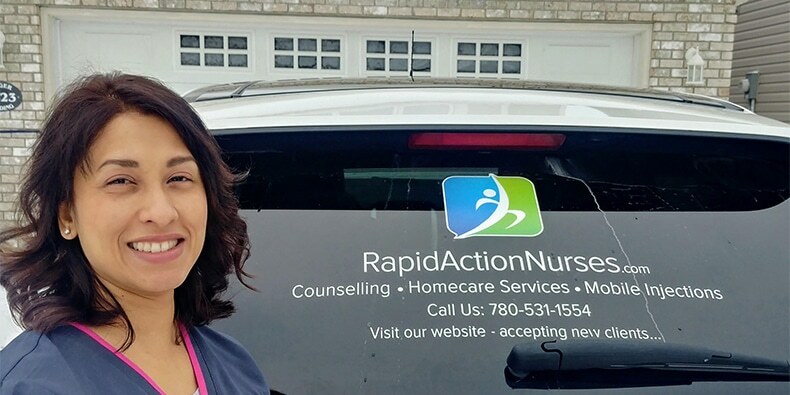 We’re excited to see how Shweta and Rapid Action Nurses continue to advance the health care field in the future!